Mike Cleveland, physical plant manager and Tyler Phelps, assistant physical plant manager, are part of EOCI’s energy team for Strategic Energy Management. Because they operate 24/7, correctional institutions are highly energy intensive. 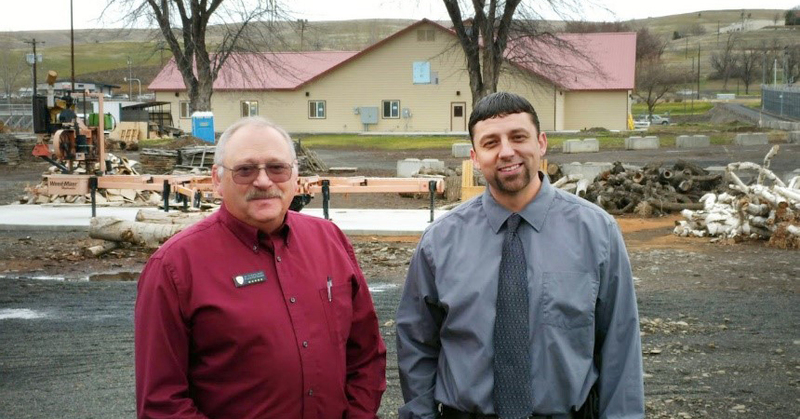 Eastern Oregon Correctional Institution (EOCI) in Pendleton is no exception. What is unusual is that EOCI—a medium security facility for up to 1,700 men—has spent 12 years improving the energy efficiency of its buildings, many of which date back to 1913. Those efforts are delivering estimated annual energy savings of $300,000 and earning EOCI national recognition. Thanks to its achievements, EOCI became the first prison in the U.S. designated by the U.S. Department of Energy as 50001 Ready—an approach that allows facilities to self-attest to meeting ISO 50001, a voluntary global standard for energy management systems in industrial, commercial, and institutional buildings. “We jumped into SEM because we never have enough budget to do everything we want, so the question became how to do right by the facility with very limited resources on hand,” said Mike Cleveland, physical plant manager at EOCI. SEM helped EOCI create a culture of energy awareness that gets all employees involved and taps into the facility’s Green Team, which is charged with finding ways to be more sustainable. Adults in custody also contribute by brainstorming ways to reduce energy waste. Energy Trust provided EOCI with web-based tools to track its energy use in real-time, allowing personnel to monitor their progress and alerting them of unexplained spikes in consumption so they can quickly address problems. EOCI also received Energy Trust cash incentives based on documented savings. Capital projects have also made a major contribution to EOCI’s energy savings. The facility has upgraded chillers, retrofitted boilers, installed insulation, replaced heat pumps and swapped inefficient high-pressure sodium lights with LEDs, which require a fraction of the energy while improving safety and security. Energy Trust provided technical assistance on capital projects and cash incentives to help offset the added cost of choosing energy-efficient equipment. In fact, including SEM and capital projects, EOCI has received more than $383,000 in Energy Trust cash incentives since 2006. 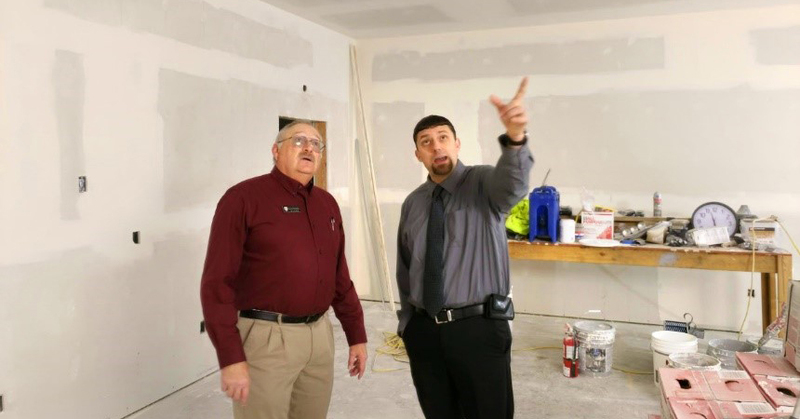 Mike Cleveland and Tyler Phelps check out progress of construction for EOCI’s new wellness and training center for employees. EOCI did just that when it was time to design its new wellness and fitness center for employees. Scheduled for completion sometime this spring, EOCI is working with Energy Trust to consider several energy-efficiency features for the center, including LED lighting and a high-efficiency water heating system.